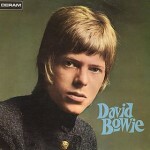 David Bowie is the debut album by British musician David Bowie, released in 1967 on Deram Records. Its content bears little overt resemblance to the type of music that later made him famous, such as the folk rock of “Space Oddity” or the glam of The Rise and Fall of Ziggy Stardust and the Spiders from Mars. All songs written and composed by David Bowie. 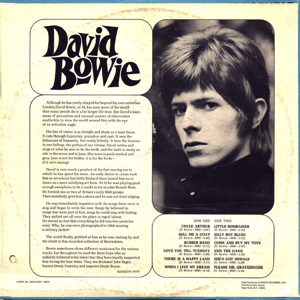 David Bowie’s influences at this stage of his career included the theatrical tunes of Anthony Newley, music hall numbers by acts like Tommy Steele, some of the more whimsical and ‘British’ material by Ray Davies of The Kinks, Syd Barrett’s slightly cracked nursery rhymes for the early Pink Floyd, and the Edwardian flam shared by such contemporary songs as The Beatles’ “Being for the Benefit of Mr. Kite!” The desire of Bowie’s then-manager, Ken Pitt, for his charge to become an ‘all-round entertainer’ rather than a ‘rock star’ has also been cited as impacting the songwriter’s style at this time, which virtually eschewed any rock ‘n’ roll trappings.Bowie himself has said that his debut album “seemed to have its roots all over the place, in rock and vaudeville and music hall. I didn’t know if I was Max Miller or Elvis Presley”. 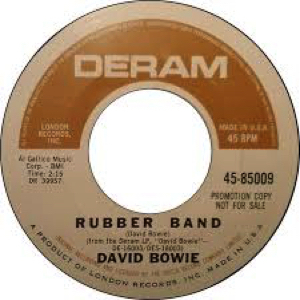 The album was solely written by Bowie, who also arranged with Dek Fearnley, having reportedly taught themselves the craft using the Observer Book of Music.”Rubber Band” was a marching tune that employed tuba as the lead instrument. “Little Bombardier” and “Maid of Bond Street” were in waltz time, and also made extensive use of brass and strings. “Love You till Tuesday” and “Come and Buy My Toys” were among the few songs on the album with a lead (acoustic) guitar, the former heavily augmented by strings. “Join the Gang” was a rare excursion into contemporary youth culture, an acerbic observation of peer pressure and drug use, which included sitar in its instrumentation as well as a musical quotation of The Spencer Davis Group’s recent hit “Gimme Some Lovin’.” The final track, “Please Mr. Gravedigger”, was “a macabre duet for voice and sound effects”,and has been described as “one of pop’s genuinely crazy moments”. Despite the album’s incongruity in the Bowie catalogue, some commentators have discerned embryonic themes that inform the artist’s more mature work.”We Are Hungry Men” is told by a self-styled “messiah” whose persona would reappear in different forms in the songs “Cygnet Committee” (from the album Space Oddity), “Saviour Machine” (from The Man Who Sold the World) and “Oh! You Pretty Things” (from Hunky Dory), as well as in the protagonist of The Rise and Fall of Ziggy Stardust and the Spiders from Mars. The track also explicitly referenced subjects like abortion, infanticide and cannibalism. “There Is a Happy Land” was an early manifestation of Bowie’s vision of children as a race apart from their elders, a theme revisited on The Man Who Sold the World, Hunky Dory and Ziggy Stardust. “She’s Got Medals” was a gender-bending tale with gay and lesbian connotations that predated the ‘dress cover’ of The Man Who Sold the World and the bisexual/androgynous character of Ziggy Stardust. Prior to releasing the album, Deram issued two singles with the same personnel, “Rubber Band” b/w “London Boys”, in December 1966, and “The Laughing Gnome” b/w “The Gospel According to Tony Day”, in April 1967. “Rubber Band” was a different recording to the album track. “London Boys” has been lauded as Bowie’s first mini-masterpiece,a melancholy observation of the London Mod scene of the time. “The Laughing Gnome” was a novelty record featuring high-pitched vocals but the varispeed technique used to create this effect would serve Bowie in more serious fashion on many future songs including “After All”, “The Bewlay Brothers”, “Fame” and “Scream Like a Baby”. The song became a hit when reissued in 1973, in the wake of Bowie’s commercial breakthrough The Rise and Fall of Ziggy Stardust and the Spiders from Mars. Despite it being radically different from his material at the time, the single made No. 6 in the UK charts. A re-recorded version of “Love You till Tuesday” b/w “Did You Ever Have a Dream” was released as a single in July 1967. 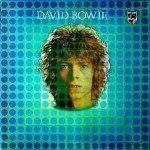 David Bowie was released in the UK, in both mono and stereo, on 1 June 1967, the same date as The Beatles’ Sgt. Pepper’s Lonely Hearts Club Band. It was issued in the US in August 1967, minus “We Are Hungry Men” and “Maid of Bond Street”. The album and its associated singles were all commercial failures at the time and Bowie did not release another record until Space Oddity, two years later. 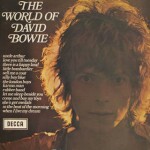 The songs from the debut album and its singles, plus later Deram works, have been recycled in a multitude of compilation albums, including The World of David Bowie (1970), Images 1966–1967 (1973), Another Face (1981), Rock Reflections (1990), and The Deram Anthology 1966–1968 (1997). A number of the songs also appeared in Ken Pitt’s promotional film Love You till Tuesday, shot in 1969 but kept on the shelf until 1984, when it was released to video with a companion album on CD. The album itself was reissued by Deram on CD in 1987. The booklet reprints the original press release by Kenneth Pitt and a new 1988 essay by John Tracy. In addition, the rear sleeve notes the different versions included. These are “Rubber Band” (Version 2), “When I Live My Dream” (Version 1) and “Please Mr. Gravedigger” (Version 2). In 2010, the album was released in a deluxe edition by Universal. This features both stereo and mono mixes of the album, together with previously unreleased stereo mixes of songs not originally included and for the first time as an official release, the first BBC radio session. The answer is Yes. Not just on the strength of this album but merely because ‘Space Oddity’ is not the be all and end all of his talents, and because David Bowie has been around writing some very good songs for the past four years. Unheralded, and to a great extent, unnoticed, except by the Bowie believers and devotees. 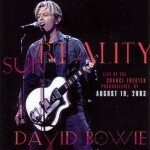 This album then is David Bowie NOW As he has always been, David is a very social writer: He does not exactly make blatant soda I comments, but rather uses social diseases and the rather frightening atmosphere we all live in as a back-drop to his songs. ‘David Bowie’ took six months to write.”This has been a good writing period for me and I’m very pleased with the outcome.I just hope everyone else is too” says Bowie. The album is out at the beginning of next month. On it David has arranged all the tracks, and is helped along in some al most semiclassical sounds by Junior’s Eyes.The atmosphere of the album IS rather doomy and un-nerving, but Bowie’s point comes across like a latter-day Dylan. It is an album a lot of people are going to expect a lot from.1 don’t think they’ll be disappointed.